Topping this year's list with nine nominations is Latin hip hop artist Residente, with Colombian reggaeton singer Maluma following with 7. Shakira picked up six nominations, while Kevin Jiménez ADG, Juanes, and Mon Laferte each scored five nominations. "More than ever, Latin music continues to have an enormous cultural impact by uniting people throughout the world," said Gabriel Abaroa Jr., President/CEO of The Latin Recording Academy. "Many of this year's nominees have expanded beyond traditional genres to create different fusions through creative collaborations. These artists, producers, and writers, united by artistic excellence and devotion to their craft, have come together to deliver eclectic music that has resulted in worldwide success." 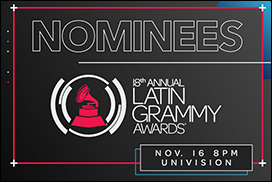 This year's winners will be revealed during an awards gala on November 16th live from the MGM Grand Garden Arena in Las Vegas, and broadcast on the Univision Network.